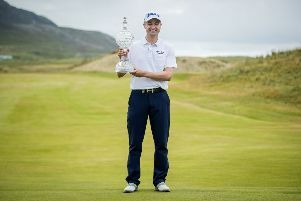 The Holywood man reserved his best round of the week until Sunday, after three previous rollercoaster days of action, to finish on five-under for the tournament. It left him eight shots behind eventual winner Tiger Woods (13 under), who claimed his fifth green jackett and the 15th Major win of his career. 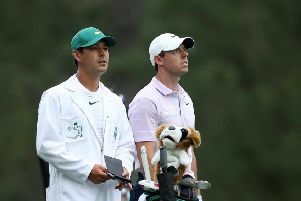 Much had been made of McIlroy’s pursuit of the grand slam club, of which Woods is a member, in the build-up to this year’s Masters. It was never on the cards, however, following a 74 on day one, then successive 71s before Sunday’s final round. The recently crowned Players’ Championship winner put that inconsistency down to a lack of sharpness and time off he took following his involvement in the World Golf Championships in Austin, Texas, at the end of March. As a result, McIlroy - who missed last week’s Valero Texas Open in San Antonio - is already considering his schedule in the build-up to next year’s Masters. ‘I might play the week before,’ he said. ‘I was sorting talking to my dad on the way here on Sunday, saying I might play the week before. ‘If anything I just wasn’t quite as sharp as I have been in previous weeks. ‘I played quite a bit leading up to this, but obviously took the week off last week. McIlroy’s preparations for Augusta included that Players Championship success at Sawgrass in March and seven top-10 finishes. That form saw the four-time Major winner move up to third in the world rankings - but he admitted he’ll learn more about himself and his game from his latest Masters exploits. He added: ‘I think you learn more from these weeks than you do the other weeks. ‘You’ve got some time to reflect out there and maybe think about where you could have done things maybe slightly differently. ‘But I’ve got two weeks off now which I’m looking forward to, and looking forward to regrouping.